I have to go on record as saying that I am not always blown away by rock bands doing shows with orchestra. It often seems to me that in this type of an arrangement the symphony either serves as simply an accompaniment, a role that can be equally served by keys, or tends to overshadow or take away from the actual thrust of the musical compositions. Well, this one is an exception. While there are some instances where the orchestra's role seems mostly to be icing on the cake, even when they do that, it doesn't take away from the music's original power. The real joy here, though, is the fact that many songs have been completely reworked to give the orchestra a role in the central melodies and song structures. In those instances this album really shines. There are no dogs on the disc, but a couple tracks I might have a tendency to skip over (if I think about it). There are a few on show here that are definite "do not miss" cuts. All in all, this one is a very strong album. Fans of Tull should love it. Those who just like progressive rock or rock with orchestral arrangements should also be pleased. Anderson has done a great job here. 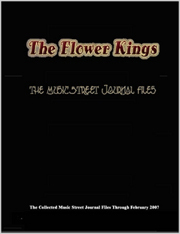 This review is available in book format (hardcover and paperback) in Music Street Journal: 2005 Year Book Volume 1 at lulu.com/strangesound. This one starts with accordion, then moves into a rousing Celtic type arrangement that, while acoustic, is quite energetic. This wanders into other world music as the accordion and flute trade solos. I have to admit to being a coffee addict, so this cut that Ian Anderson calls "the cappuccino song" is an instant winner with me. Musically it comes across as a bouncy, but fairly typical Tull song with an acoustic mode. This is fun. 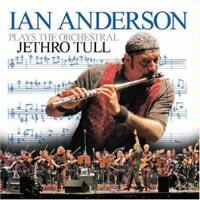 A Jethro Tull classic, this gets an interesting reworking. This acoustically based arrangement even feels a little country at times. The orchestra here starts to take just a little more of a role (although I really didn't hear them on the earlier numbers). This is a strong one. This one feels even more like Tull than the earlier tunes and includes an incredibly strong arrangement. It's a nice Christmas song. Another classic Tull piece, this one receives a solid treatment here. What an awesome jam this instrumental is! And the orchestra truly earns their keep here. This ballad is lush and works extremely well in this arrangement. This instrumental comes in very sedate and proggy with Anderson's flute accompanied by the orchestra. It moves through several themes and gains a little bit of energy, but never wanders from this layout. Another favorite, this short piece takes on a bit of a cross between a classical and a Celtic texture in this arrangement. It's pretty and both novel and faithful. Starting with the familiar acoustic guitar and flute intro, this is a pretty cut. The orchestral arrangement here adds mostly to the mood of the piece. This has always been a Tull favorite for me. I like this take on it at least as much as the original. Anderson's spoken introduction on this one is priceless. Considering that this song was originally written by J. S. Bach, it seems appropriate to have an orchestra performing it. In fact, they start it, then give way to Anderson's solo flute before they return and then the rest of the rock musicians join in. This one has a killer symphonic texture and some great moments. I've always loved Anderson's flute take on this, and he doesn't disappoint here. I have to say that I think this version far outdoes the standard Tull rendition. Ian's weird vocal and flute tantrum at the end finds him in fine form. This is an entertaining little instrumental. Another Tull classic, this one works quite well here. It's always felt a little too lounge lizard for my tastes, but it's still entertaining. From the Tull Christmas album, this one has a major classically oriented texture that is very beautiful and powerful. It's considerably intricate and compelling. This has been a song that kind of outworn its welcome with me. I mean, while it's a good number I've heard it way too many times for it to be interesting anymore. Well, that was until I heard this version. The arrangement here turns it on its head and breathes new life into it. It starts with the orchestra working the themes. Anderson's flute takes the vocal line over top of this. They work through in this format for a while, then it drops to the first verse. Anderson's vocal is accompanied here only by the orchestra. Then percussion takes it joined shortly by the flute in a cool echoed solo. Crunchy guitar gradually rises from there in the familiar riff and the orchestra, along with the flute, weave lines of melody around this backdrop. The lead guitar and keys join in this arrangement still working prog lines of melody around. This turns into an incredible extended instrumental section that swims and soars like a living, breathing creature. It then drops away and just orchestral instruments begin to take the musical arrangement with the old familiar themes. Anderson's voice takes an acapella line, then orchestra and band rise as one to create the themes to accompany his singing. As the acoustic guitar based bridge starts it is in the traditional format. Shortly, though, the orchestra again makes its presence known, moving along in patterns above this. It drops again to just the orchestra after a time. Then they begin again to rework the piece until guitar rises up to join them to end the piece. A killer bouncing jazzy like take on the holiday classic, this is fun. It feels like, as Anderson hints in the introduction, Tom and Jerry music mixed with classical, jazz and Tull. This is quite cool. Always one of my favorite Jethro Tull numbers, this rocks here. The orchestra doesn't add a lot to the overall power of the piece, but it does more to augment the sound than anything else. It's not to say that they aren't heard here, just that I think the general song structure is the true strength of this one. There are even short segments dominated by the orchestra, but when something is as good as this one, how can you improve it by adding the orchestra? To me they serve more as icing on the cake. Anderson is purely on fire on this one. Starting just on keys, this builds into a powerful joint progression of band and orchestra to ever so gradually weave a powerful arrangement. It drops to just voice, then voice and acoustic guitar for the verse. The orchestra comes in shortly to accompany. Eventually, after growing and progressing, they work in a short burst of guitar soloing, then launch into a series of redefinitions of the piece as it carries on. After a while like this, they drop it back to just mellow guitar, then gradually turn this into a spacey jam. This gets quite powerful and covers quite a bit of musical territory in its extended format. At times, the band is in command and at other points the orchestra seem to dominate. They eventually make their way back to the verse structure to carry it one, the band taking the majority of that, then move forward through a potent and extended guitar solo, the orchestra accompanying. Then they drop back to just acoustic and vocals to lay down another chorus. Next it seems to end til a piano restarts and the full ensemble takes up a reprise in an invigorated and very powerful movement. Everyone shines her and all you can say when it's over is, "wow!" The classic begins with the traditional piano, but the orchestra starts by echoing the lines and reinterpreting them. When the guitar finally crunches in the orchestra plays counterpoint filling in melody as accompaniment, and this is all in the intro! As it moves into the song proper it's pretty true to form and rocks out quite well. The orchestra mostly lays down the icing over top of this cake.